Tags: arisia, boston, if, interactive fiction. As Zarf has already written, WordPlay centerpieces this year’s (somewhat geographically displaced) weekend for the IF gathering that the Boston crew has hosted more or less annually since 2010. He and I will both be in attendance, as well as many friends in interactive fiction from around the world. Do say hello, should you find yourself there too. As the schedule notes, at 12:15 on Saturday I shall be narrating a group play-through of Sam Barlow’s classic work of minimalist parser IF, Aisle, taking next-move suggestions from the audience. I don’t know if this’ll be recorded, but if so we’ll certainly share the results here later. Tags: conferences, if, interactive fiction. Tags: if, interactive fiction, talks, the warbler's nest. Due to the weather that buried Boston over the weekend, we’re postponing my presentation about The Warbler’s Nest at MIT, originally scheduled for Monday. I’ll post again when I know the new date. Sorry about that. Stay warm, y’all! Tags: boston, mit, talks, the warbler's nest. Tags: boston, if, mit, talks, the warbler's nest. Tags: boston, conferences, if, interactive fiction, meanwhile, shade, zarf, zarfhome. Tags: boston, conferences, if, interactive fiction, shade, zarf, zarfhome. A tiny update to an earlier post: the BostonFIG submission deadline’s been extended by another 10 days, to Monday, August 20. That gives another week and a half to New England-based game creators, working in any medium, to submit their work for inclusion in this year’s festival. A prize-list for the videogame showcase, comprising various hardware and software goodies, is starting to appear as well. Full details at the BostonFIG website. Update: The submission deadline’s been extended to August 20. This is a good year for inaugural game conferences in Boston. On the heels of No Show comes The Boston Festival of Independent Games, held around Cambridge’s Kendall Square on September 22. BostonFIG will be a public series of events centering around locally produced games, be they digital, tabletop, or otherwise. Admission is free, though the event’s website does request that you register before showing up. New England-based game makers have through August 10 — that’s this coming Friday — to submit their own works for inclusion in the festival. Each game submitted will be examined by at least one of the festival’s curators (the list of whom includes Y.T. ), who will provide studied feedback to its developer. Submissions that meet BostonFIG’s display criteria become eligible for inclusion into the festival’s showcase. The game submission fee for the videogame showcase is $15 ($10 for students), and is waived entirely for tabletop and street-game submissions. We’re especially interested in receiving student work, in fact, as well as card games and board games produced around these parts. BostonFIG’s own copy about the festival submissions process, including relevant URLs and more specific instructions, follows. Hope to see your games! Continue reading BostonFIG game submission deadline: August 10. Tags: boston, conferences, if, movies, pax. Continue reading Slash Fiction and other puzzles. Tags: mit, mystery hunt, puzzle hunts, puzzles. Tags: boston, boston cyberarts festival, brian moriarty, cambridge science festival, if, pr-if, purple blurb. Last weekend, I attended the first Boston Cardboard Game Jam. It was like one of Boston Game Jams' usual events, but this time for card and board games instead of videogames. The basic idea is that a bunch of people congregate and split up into teams of 3–4 people and make a game over a weekend. I've never been to any of the videogame ones, but according to Jeff Ward, this one was way better. It was a really great experience for me, and I'm really glad I went. The key takeaway for me was that being forced to collaborate with a small group of people for many hours with a hard deadline really gets the creative juices flowing, even if it can be frustrating at times. One of my teammates does a great job of explaining the various iterations we went through. There were definitely times I felt like quitting, and I'm sure my teammates were similarly frustrated at times, but we kept at it and developed a pretty nice auction card game that plays in around an hour. And having other people there to playtest it was key, since we certainly wouldn't have gotten it to where it needed to be without some key insights from other smart people. I thought it was some neat synchronicity when, this week, Craig Perko talked about how college should be about doing lots of projects with people who share your interests, and last weekend really felt like a mini version of that. I'm keen to try this again in the very near future, although I don't know if I'd be able to organize something like this before Boston Game Jams decides to do it again. I'm also keen to just make more games, even on my own. If you're keen to do that, too, then you could do worse than checking out Ian Schreiber's free blog-based course that he ran two summers ago (and that is still around) called Game Design Concepts (and you could also check out his book with Brenda Brathwaite, Challenges for Game Designers). I had a simple game idea, too, which I actually solidified enough to pitch at the game jam. I didn't get anyone to work on it with me, but I've been thinking about it since then and definitely have a set of rules to try out with some people the next time I can find three other people and have my Sevendeck and Icehouse pieces handy. And I'm serious about wanting to think about pulling together another cardboard game jam, even if it's only with a group of 8–10 people (I'm not sure what the critical mass is, since having people for playtetsing, as I mentioned, is pretty key). If something like this were to happen again, even if it didn't take place in a cool place like GAMBIT, are there any Boston-area Gameshelf readers who would be willing to give it a shot? Tags: board games, boston, card games, game jam. Spring Thing entries have been released. We'll probably at least mention this. Possible talk/demo of common-sense AI stuff. Afterwards, usually around 8:00 or so, we'll head over to the Cambridge Brewing Company for food and/or drinks. Newcomers welcome, even if you don't know anything about interactive fiction. We also have a mailing list you can join to hear about events and whatnot. Andy and I plan on attending the sixth annual BarCamp Boston this weekend, April 9 and 10. BarCamp is a geek-centric “unconference” whose schedule of talks is constructed on the fly by attendees. In my experience, each hour-long slot tends to end up with someone talking about jQuery, someone talking about Ruby on Rails, and then someone talking about volcanoes, or food science, or something else they’re passionate about and which doesn’t resemble my day job in any way. So I go to these third talks, one after the other, and have a grand time. This year, at friends’ encouragement, I plan on myself pitching a talk that I hope falls into that third category. Unsurprisingly, this’ll be my introduction-to-Inform talk, yet again. In the likely event I manage to make it happen, that’ll be three times in the last eight months I’ll have presented it, just weeks after I busted it out for the PAX crowd (with Zarf’s assistance, which he may reprise once again here). It’s starting to develop into what Merlin Mann calls a Shake-and-Bake talk, one that a practiced speaker can perform with increasingly minimal preparation. I can’t say I really expected to ever develop such a thing, and I wouldn’t have predicted Inform 7 to be my topic if I did. But, so it goes. If you’re in my town this weekend and this sounds like your idea of a good time, feel free to register online — Boston BarCamp is free to attend (though they’d appreciate a $20 donation, which’ll also net you a natty T-shirt). 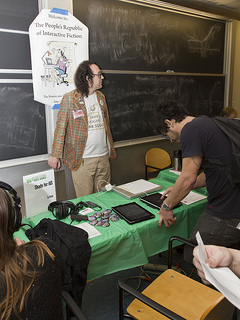 Tags: barcamp, boston, conferences, if, inform, interactive fiction. I wrote a whole lot about last year's PAX IF events, because that was my first PAX and everything was exciting and new. Now it's my third (two in Boston, one in Seattle) and... everything is ho-hum and tired? No. It was an exciting weekend. But I may gush less about it this year. Continue reading PAX East 2011: Zarf's anecdotes. Tags: boston, convention, if, kickstarter, pax, pr-if, quixe, vorple. 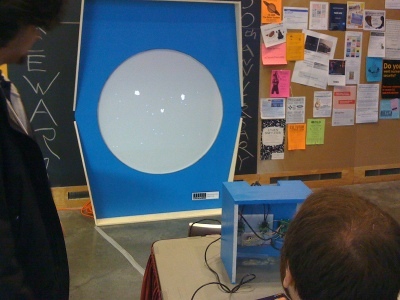 Zarf’s already posted the schedule of IF-related events at PAX East 2011 (this coming weekend! ), but as an egomaniac I just wanted to highlight the one event I’m directly involved with: Zarf and I are going to reprise the lightning-talk introduction to Inform that we first presented at GameLoop last summer. We’re going to build a very small game that shows off some of Inform’s major features, especially its natural-language syntax. The talk will happen at 7 PM on Saturday, March 12, in the Alcott room in the Westin Waterfront hotel. Like the rest of the events happening there and in the suite, the talk is free and open to the public — you don’t need a PAX badge to come join us. Hope to see you there! Tags: if, interactive fiction, pax, talks.